Home › Energy-Efficient LED Lighting › [Upgrade Version] Ilyever 40 Led Globe Long String Lights Warm Color Battery ..
[Upgrade Version] Ilyever 40 Led Globe Long String Lights Warm Color Battery ..
Two Function Modes: Steady & Flash satisfy different requirement.The White Battery Box with Steay / Flash/ Off Feature that is Easy to Hide and Requires 3 AABatteries (Not Included). It Has Locking Clips (NO MORE SCREWS!!!) to Easy Open and Close the Box. EXECLLENT ILLUMINATION -- 40 Warm white led bulbs create excellent illumination and a warm atmosphere, spreading light and cheer across a wide area. Decorative your garden, porch, bedroom, door, even the party with the string light. Add a beautiful glow to your life. Energy saving and environmental protection. light is healthy, does not contain ultraviolet and infrared light, no radiation, no pollution, protect eyesight. 100% SATISFACTION GUARANTEE! If for any reason you're not 100% SATISFIED, let us know and our customer service team will help you return or refund. Color: Warm light Ilyever Bright LED Dewdrop Starry String Lights create a magical lighting experience for your home, party or business The LED Starry Silver color wire String Lights are made with a fine bendablesoft wire that can conform to any shape to add a beautiful decorative accent.Flexible yet durable, the string lights are perfect for positioning lights toany decorative or holiday project. Warm-Yellow LED's are individually mountedalong the string and provide an elegant sparkling glow that can be seen fromany angle. 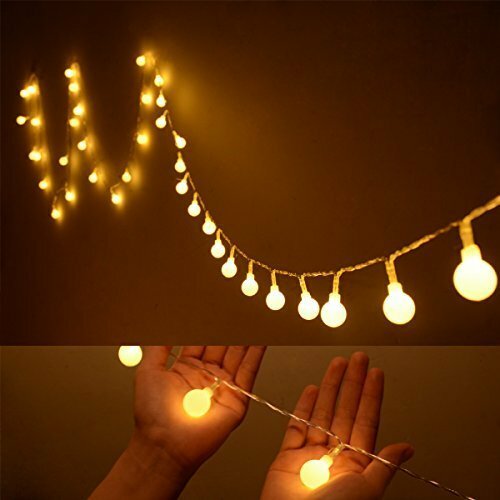 Specification: String length: 13ft Diameter of each globe: 0.7 inches Globes are spaced every 4 inches Color of the globe: White Light color: Warm white 2 light modes: Steady on and flash Power source: 3 AA Battery (not included) Weight:100g The advantage of the LED string light: Safe (requires 3 AA batteries, totally 4.5 volts, exclude any high-voltagesafety hazards) Convenient (with switch, no need to worry the socket loation, availableeverywhere, movable) Are the globes fragile No,they are hard plastic Do I have to assemble the light strip by myself No, the light is all ready for use, you'll receive what you see in thepictures. How is the lights effect Soft glow, perfect for all kinds of festival celebration use.